Chair Massage at our site (for individuals), or for Corporate programs and events. 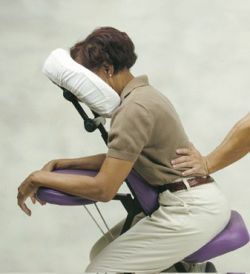 Chair Massage. Courtesy of ABMP. relaxation and relieves work related stress. As a corporate event Chair Massage can be an expression of appreciation from the employer towards the employees, who are always very happy and grateful to receive a 10 minutes chair massage.